He recalled, “I needed an adventure. Because I had an American soul that was born into a Swiss body, I could see only one way forward: go to the US and get a master’s degree.” Schnell obtained his Master of Science at Ohio University. “That work was mostly based on quantifying and modeling human visual capabilities and limitations, especially at low light levels. I applied my software background to build computer models that could predict how far you could see things like road signs and pavement markings under automobile low-beam illumination at night. My advisor roped me into getting my PhD, and I took on a position as a full-time research engineer.” Schnell earned his fixed-wing pilot’s license in Ohio on a Piper Cherokee and later received his helicopter rating in a “squirrelly” Robinson R22. 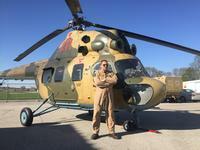 Since his first pilot’s license, he has frequently added ratings and certifications and flown more than 1,700 flight test sorties involving commercial air transport, rotorcraft and fighter-type aircraft. Aviation gives the OPL most of its real-world challenges. Schnell said, “In the military and helicopter EMS, it is controlled flight into obstacles — wires — in the DVE and landings in the DVE. The military wants to equip their helicopters with technologies that not only allow them to land a helicopter in DVE; they want to own the DVE, use it as a tactical advantage. What’s more, they want to perform complex operations in the DVE involving perfect coordination of multiple rotorcraft ingressing from different directions to an objective area, executing drops and attacks, delivering payloads, interacting with autonomous assets, ground teams and vehicle, all in the cloak of DVE; and then leave in a coordinated way in different directions. The paths in and out must be tactically changeable and unpredictable, the opposite of an instrument approach, if you will. “To get to that point takes an extreme amount of work [like] sensor development, display development, integration, symbology design and testing. We want to provide our testbeds early in the design cycle so that designers can try out their integrated equipment early in the design when changes can still be implemented. This is what our testbeds are designed to do. It is design-risk mitigation.” Fixed-wing flight testing is done on a pair of L-29 jet trainers and the Bonanza CARP (Computerized Airborne Research Platform). The simple, rugged Mi-2 helicopter testbed — acquired late in 2012 from a flying museum — provides a spacious, smooth-flying sensor platform. “Of course ours has a few mods,” said Schnell. It has a CAAS [Rockwell-Collins Common Avionics Architecture System] cockpit, a Hensoldt-provided Zeiss Optronics head tracker, an eight-channel digital video recorder, and hands-on-collective-and-stick buttons for the experimental payloads. “It is, as they would say in the Wheeler-Dealer [classic automotive sales] magazine, ‘fully loaded.’” The OPL plans a second Mi-2 outfitted with large-format displays in line with Future Vertical Lift cockpit concepts. The successful DVE trials at Yuma used a BAE Styker helmet mounted display (HMD), SferiSense 500 lidar and UTC Aerospace Systems short-wave infrared sensor, but Schnell noted, “The systems that we fly in full brownout are still very expensive. You are talking $400,000 for an HMD, something like $200,000 per sensor, and you may want two or three of them, plus head trackers, software, processors, etc. This is probably a bit out of reach for some operators.” And the systems have to work in good visual environments (GVE), low light, strong sunlight, etc.